Q: Hello Antoaneta, you had probably observed the games of your compatriot Veselin Topalov and Gata Kamsky, what are your impressions about this match? A: Of course I followed the match, each game was very interesting, and okay, as we hoped, Veselin won and proved that he is currently in better shape. I was surprised to see Kamsky spending that much time in certain positions, and in the end, as the games were very complicated, it was difficult to find the best moves during the time trouble. All this tells me that Topalov was better prepared for the match. Q: What do you think about the first two games where Topalov had White and Kamsky managed to hold with the Gruenfeld Indian defence, opening against which Topalov has a crushing score? A: Well, of course, Kamsky is also very strong player, he was successful in defending those slightly weaker positions. He did well in Gruenfeld, but he lost on the other side. Q: Let’s talk about your own plans. What will be your next tournaments? A: The Women’s Grand Prix is finally starting. I am happy that this series has launched, even though the prize fund is not even remotely close to the men’s Grand Prix. But okay, this is a start and I’m hoping for better in the following years. 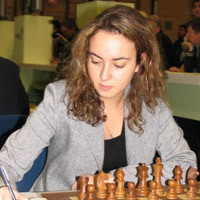 It is very important for women’s chess to have more strong tournaments. We will play the first Grand Prix in Istanbul, but I don’t like the fact that it is overlapping with the European Individual Championship that is being played in Sankt Petersburg. I hope the calendar will be composed with more consideration in the future. There are not many women’s tournaments in general and now suddenly we have two scheduled to take place at the same time. I can’t understand that. Q: And after the Grand Prix? A: After that I am playing in the Russian League, for Spartak Vidnoe. I won the championship twice with my former team of AVS, now I hope to bring some of this luck to Spartak. Q: Do you prepare individually or you have a coach? A: I do some work on my own and I also prepare with GM Vladimir Georgiev, who is my coach for many years already. We will see the results in Istanbul (laughing).